Tonight I told the girls to sit on the couch b/c I had a surprise for them. I went to the basement and brought up a box that hadn't been opened for nearly 15 years. The box contained my wedding dress. 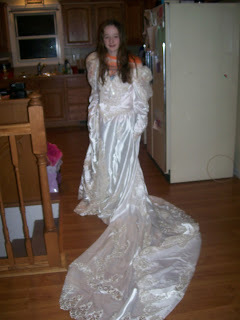 I sent it to the cleaners after the wedding and they cleaned it and sealed it up in a box. Why would I choose to open it now? Because I am donating it to a very special cause. The Mary Madeline project will use my dress to make outfits for the tiniest of babies that are born in hospitals across the country. The outfits are donated to hospitals and given to parents when their baby is born too tiny. This offers them a chance to have pictures taken in a beautiful outfit that actually fits their baby. 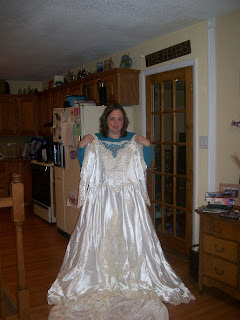 I am donating the dress in honor of my nephew Declan who was born weighing just over a pound. Declan's name will appear in a card attached to each outfit. Some of the cards will also feature the name Kamryn Olivia, in honor of my friend's baby who was born too tiny. When I first opened the box tonight, I whispered to Scott that I didn't think I could do it. But as I looked at the dress, I realized just how many outfits could be made from it. I am sure this is what I want to do. 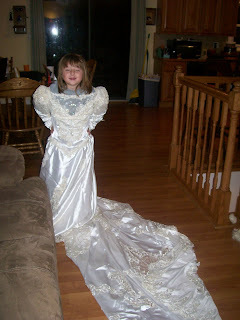 I am so grateful I can put my dress to good use. I felt so helpless when Declan was born. All I could do was stand back and pray. Now I will know that the dress I wore on the day I vowed to love, honor and cherish will help other parents love, honor and cherish the memories of their tiny babies. Michele, I cannot begin to describe my feelings. This is not a decision to be taken lightly on your part and yet it seems so right at the same time. My heart hurts when I think about all the mothers who will need pieces of your dress to cover their children. When you walked down the aisle in your beautiful dress 15 years ago with the rest of your life in front of you we had no idea how our stories would unfold. Thank you for doing this not only for Declan and Kamryn but for all the families who will be touched by the grace of the fabric worn with a promise to love, cherish and honor. What a great example you are setting for Megan and Emily. Michele, I cannot even imagine how this touched Linda and Kasey, since I almost cried. it is such a beautiful thing to do. Now that you told me about it, I am thinking about it too. You are are great example to many of us. Michele, you inspire me in so many ways. Thank you. what a wonderful thing you are doing. I was crying by the end of the blog. And it's 5:00 in the morning - I don't tend to be really emotional this time of the morning! I saw your blog from Antique Mommy. What an amazing project/idea! Thanks for sharing! What and awesome thing to do Michele! It was so good to see you on New Years Eve. You look great! What an amazing gift to give! I'm just speechless at such a heartfelt expression to honor such sweet babies and their wonderful families.